Ask Action Corps: Need help getting to “yes” with city officials? Our lunchtime webinar series, Ask Action Corps, brings the real-life challenges of resident leaders to a panel of ioby Action Corps experts who offer strategies, tools, and resources to help overcome them. 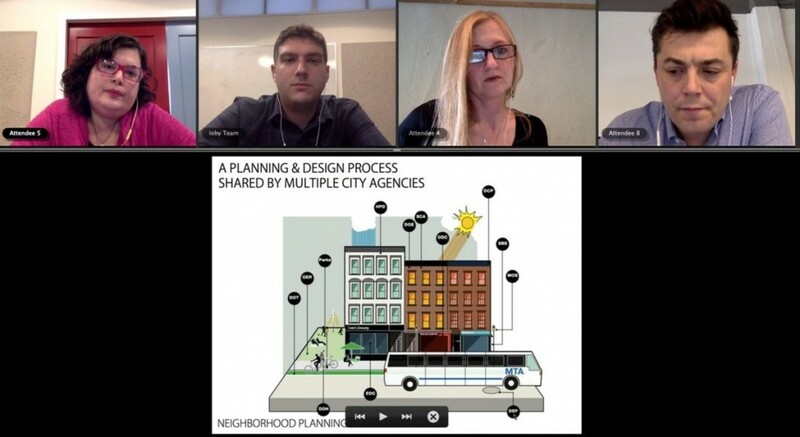 At the end of each webinar, viewers can chime in with their own questions! ioby Action Corps is our awesome network of experts who help local leaders succeed in making positive change in their neighborhoods. They’re here, they’re ready for action, and they want to help YOU implement your project! Visit ioby.org/actioncorps for more info. On December 20, 2016, Cathy Marcinko, Grant Development Coordinator at Le Bonheur Community Health and Well-Being in Memphis, and leader of The Green Triangles Project, kicked off our inaugural webinar as our first featured leader. (Full disclosure: Cathy is also an Action Corps expert!) She was joined by a panel of three Action Corps members: Justin Garrett Moore, Executive Director of the NYC Public Design Commission and an ioby board member; Tommy Pacello, President of the Memphis Medical District Collaborative; and Janet Boscarino, Executive Director of Clean Memphis, Inc. The diverse Memphis neighborhood of Vollintine Evergreen boasts many appealing features, including lovely historic homes and the V&E Greenline, the city’s first rails-to-trails project. 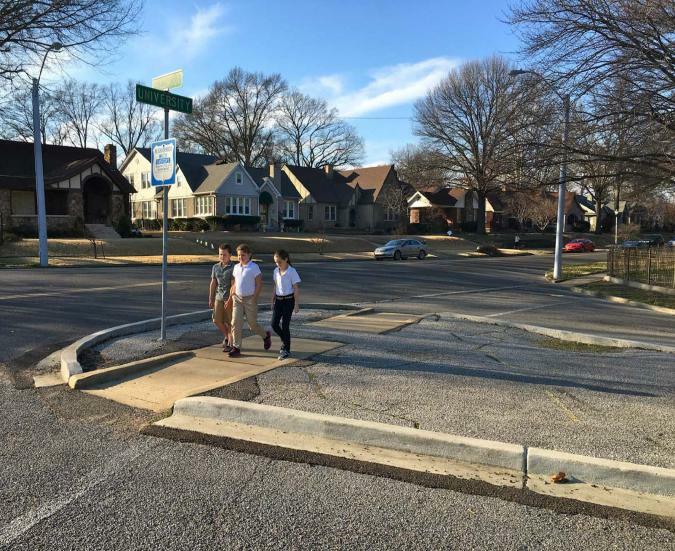 But residents are rallying behind one amenity that could use some sprucing up: the raised asphalt traffic triangles in the sprawling intersection of University Street and Jackson Avenue. While the triangles were likely green spaces when the area was developed in the 1920s, they’ve since been paved over, become deteriorated, and are now an eyesore in this otherwise verdant neighborhood. Cathy is leading the charge—with VECA, the Vollintine Evergreen Community Association—to remove the asphalt from the triangles and fill them with fresh soil and drought-resistant plants. Through their Green Triangles Project ioby campaign, the group quickly raised the $6,215 they budgeted to get the project off the ground; worked with residents and a landscape architect to develop the triangles’ new design; and had their plans approved by the Memphis City Engineer’s Office. All systems go, right? Well, not quite. While the City Engineer did give their okay, they also sent VECA a contract to sign that included two unexpected (and major) requirements: the group would need to 1) buy commercial general liability insurance totaling about $4.5 million!, and 2) lease the land the triangles are on from the city for a year. The premiums for insurance policies like these are too hefty for VECA to afford, and the group is not prepared for the additional responsibility of becoming leaseholders. So, panel: how can VECA persuade Memphis city government to “lighten up” on these parts of the contract so The Green Triangles Project can proceed? This contract might have been drawn up using boilerplate text and not pertain as specifically to The Green Triangles Project as it seems. If so, the simplest way forward might be to reply to the city and say, “We like this contract generally, but think it’s a bit overbroad. Would you consider a slightly simplified version?” Then attach the contract with the insurance and lease provisions removed, and see what they say. Illustrating how Green Triangles fits in with one or more existing city goals or initiatives—for example, Memphis’s Blight Elimination Program. Memphis’s new Adopt-A-Park program could serve as a useful reference/precedent to bring up with city officials, as it does not require liability insurance—just a “hold harmless” waiver. In Indiana, Indianapolis’s Adopt-A-Median program has succeeded for about 20 years using similar parameters (and they post their partnership agreement online). Both of these programs could help to convince Memphis’s legal counsel that a big insurance mandate might not be necessary. Have some sympathy. While this might seem like a simple project to residents, it’s part of a complex web of regulations and responsibilities that the city has to consider and is ultimately accountable for. So know that they do want to help you help your neighborhood, and help this project pave the way for other ones like it in the future. They just need to be sure all their i’s are dotted and t’s are crossed in the process. Consider framing Green Triangles as a pilot or demonstration project. This can help the city see it as a low-stakes trial run of something different—not a commitment to change. Look for nearby “anchor institutions” to partner with: they can be great allies. In this case, Rhodes College is right across the street from the triangles. Consider approaching them, presenting the project, and asking if they would agree to support it. “Support” could be as simple as lending their name to your list of backers, or they might be keen to help with the implementation work or ongoing maintenance efforts. You might as well go knocking and see what you find! Watch the full Ask Action Corps webinar or sign up for our newsletter for news on future ioby learning webinars.